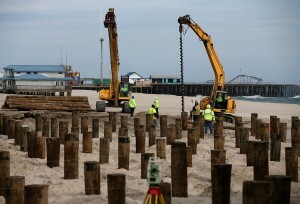 SPRING LAKE, N.J. (AP) — The average New Jersey beach is 30 to 40 feet narrower after Superstorm Sandy, according to a survey that is sure to intensify a long-running debate on whether federal dollars should be used to replenish stretches of sand that only a fraction of U.S. taxpayers use. 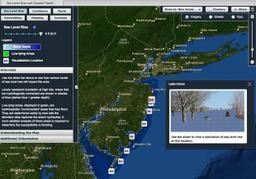 Some of New Jersey’s famous beaches lost half their sand when Sandy slammed ashore in late October. 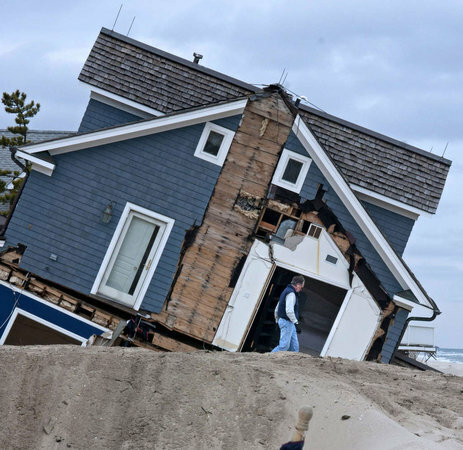 The shore town of Mantoloking, one of the hardest-hit communities, lost 150 feet of beach, said Stewart Farrell, director of Stockton College’s Coastal Research Center and a leading expert on beach erosion. 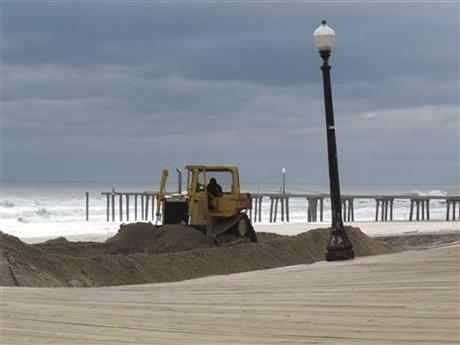 Routine storms tear up beaches in any season, and one prescription for protecting communities from storm surge has been to replenish beaches with sand pumped from offshore. Places with recently beefed-up beaches saw comparatively little damage, said Farrell, whose study’s findings were made available to The Associated Press. The beach-replenishment projects have been controversial both for their expense and because waves continually wash away the new sand. The federal government picks up 65 percent of the cost, with the rest coming from state and local coffers. How big the beaches are — or whether there is a beach at all to go to — is a crucial question that must be resolved before the summer tourism season. The Jersey shore powers the state’s $35.5 billion tourism industry. But the pending spending showdown between congressional Republicans and Democrats could make it even harder to secure hundreds of millions of additional dollars for beach replenishment. From 1986 to 2011, nearly $700 million was spent placing 80 million cubic yards of sand on about 55 percent of the New Jersey coast. Over that time, the average beach gained 4 feet of width, according to the Coastal Research Center. And just before the storm hit, the U.S. Army Corps of Engineers awarded nearly $28 million worth of contracts for new replenishment projects in southern New Jersey’s Cape May County. U.S. Sen. Tom Coburn, an Oklahoma Republican, used a photo of a pig on the cover of his 2009 report “Washed Out To Sea,” in which he characterized beach replenishment as costly, wasteful pork that the nation could not afford. “Taxpayers are not surprised when they learn how Congress wastes billions of dollars on questionable programs and projects each year, but it may still shock taxpayers to know that Congress has literally dumped nearly $3 billion into beach projects that have washed out to sea,” he wrote. A message seeking comment was left Monday with Coburn’s office. U.S. Sen. Robert Menendez, a New Jersey Democrat, predicted lawmakers from New Jersey and New York would be able to get additional shore protection funds included in the next federal budget, despite partisan wars. “I think we will be able to make the case,” he said. “We can show that this provides long-term protection to property and lives. You can either pay up front to keep on top of projects like this, or you can pay on the back end” through disaster recovery funds. Menendez this week noted that Congress has approved emergency recovery funds for victims of Hurricane Katrina and tornadoes in Missouri, among other natural disasters. During a tour of storm-wrecked neighborhoods in Seaside Heights and Hoboken, Vice President Joe Biden also vowed the federal government would pay to rebuild New Jersey. Jogging in the street because Sandy had destroyed the Spring Lake boardwalk for the second time in little over a year, Michele Degnan-Spang said it was difficult to comprehend how things have changed in her community. A few stray planks of the synthetic gray boardwalk that was just replaced last year after Tropical Storm Irene were strewn about the sand; concrete pilings that used to support the boardwalk now stretch for a mile off to the horizon like little Stonehenges. Degnan-Spang predicted she and her extended family would be back on the sand soon, though. Gov. Christie is wisely setting aside $250 million in post-Sandy federal relief funds to buy out homeowners in flood-prone areas. But he should do more. Christie’s premise is sound: to remove buildings repeatedly damaged by storms, which cost tax payers and property owners when they have to be replaced or repaired. The answer is to return the land to a floodplain and attempt to restore vital wetlands and sand dunes that could help mitigate future damage. However, this developing program must be tightly focused on the most vulnerable areas, and it needs more money. New York plans to spend $400 million in a similar effort. The administration doesn’t expect many barrier-island property owners to take advantage of the program. But that disappointing outcome could be avoided by sweetening the deal with additional incentives – in particular for those homes and businesses on narrow sand spits with a few swamp reeds, a bay in the back, and an ocean view out front, as well as buildings along narrow causeways through the marshes. MIDDLESEX BOROUGH, N.J. — By the end of next week, New Jersey should know whether it can set aside $250 million of the state’s $60 billion Sandy relief allocation to buy perennially flooded homes and turn them into public open spaces, Gov. Chris Christie said. If it happens, the governor promised a Sayreville, N.J., resident who lost her home to the hurricane that state officials will come to her neighborhood to discuss buying out flooded property owners. View video & read complete article here. At Point Pleasant Coast Guard Station, the rising ocean laps just below the quayside where cars are parked. 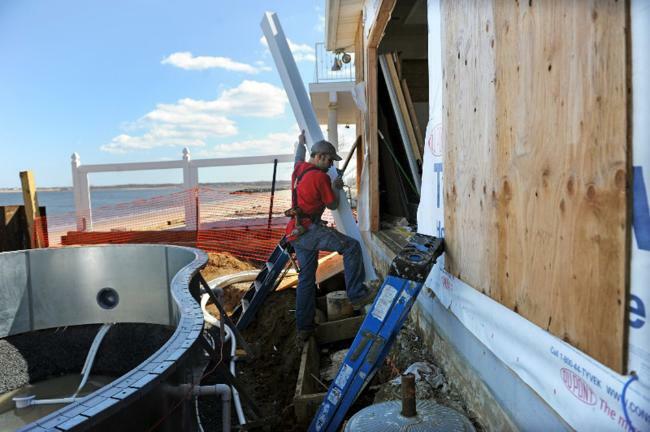 At Avalon Dunes, it’s shown advancing along a bayside street lined with expensive homes. And at Double Creek Bridge south of Toms River, the waters of the Atlantic creep toward a beachfront house that’s already just yards from the regular high-tide line. All three scenarios are depicted in photographs simulating the effects of a foot rise in sea-level on the Jersey Shore. These simulations — and others — can be seen thanks to a new online mapping tool published by Rutgers University to help local officials plan for coastal flooding in coming decades. 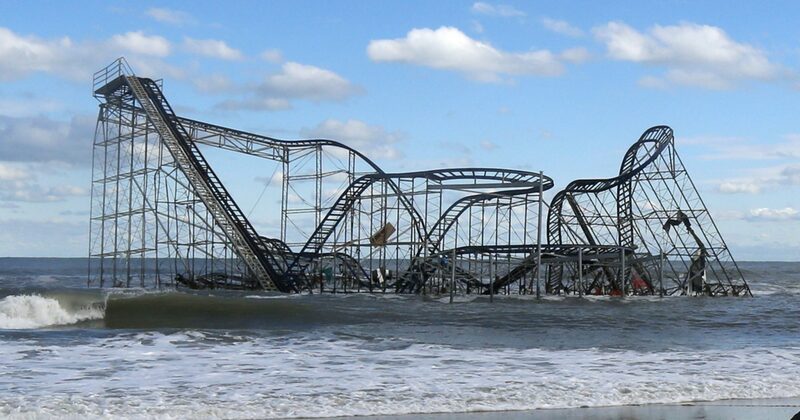 Some four months after Hurricane Sandy dramatically raised public concern about the power of the ocean, Rutgers officials are alerting government officials, businesses, and individuals to the likely effects of rising seas on their roads, bridges, beaches, docks, homes, and communities. As ocean volume increase in response to rising global temperatures and melting polar ice caps, the average high-tide level around New Jersey’s coast is likely to be one foot higher than at present by 2050, according to a consensus of national and regional forecasts compiled by Rutgers. Rutgers’ online tool makes it possible to simulate how increases in sea level will affect parts of the Jersey Shore, such as Lake Como. That’s about twice as high as the global average because the mid-Atlantic coast is sinking at the same time that waters are rising, creating an especially urgent problem for low-lying areas of coastal Jersey and Delaware — where state officials have forecast up to 11 percent of the land mass could be inundated by three feet of water by 2100. In an attempt to illustrate the practical effects of a phenomenon that may seem like a long-term abstraction, the mapping tool shows users how some locations would be affected at high tide by specific levels of sea-level rise. The website invites users to simulate between one and six feet of sea-level rise by using a sliding scale and then to watch the impact of that manipulation on photographs of familiar locations and on local and statewide maps. At Lake Como, a park bench some distance from the current level the water becomes a tiny island as a user adjusts the slider to three feet, a level that many climate scientists believe will be normal by the end of the century. At West Point Island Bridge near Tom’s River, a steel barrier beside a channel is submerged when the user simulates a four-foot rise in waters. The tool highlights the vulnerabilities of schools, hospitals, fire stations, and evacuation routes to different water levels. In Cape May County, for example, the map shows schools at Avalon, Stone Harbor, and Wildwood would be submerged as the barrier islands flood beneath a three-foot rise in sea level. In Monmouth County, hospitals in Red Bank and Long Branch would be threatened by the same degree of sea-level rise, the tool indicates. It also shows Federal Emergency Management Agency projections of what areas of New Jersey are vulnerable under so-called 100-year and 500-year flood projections, or floods so severe that they are deemed to be likely to occur only once in 100 or 500 years. A swath of the coast from Tom’s River to Cape May and then up the Delaware Bay shore toward Philadelphia is susceptible to 100-year floods, while smaller areas on the Atlantic coast are subject to 500-year floods, according to FEMA’s projections on the mapping tool. But the FEMA scenario is based on current sea levels and doesn’t take into account any future sea-level rise, Lathrop said. The agency, along with the National Oceanographic and Atmospheric Administration, is working on a revised model that may be published in coming months, he said. FEMA’s flood elevations are used as baselines by the National Flood Insurance Program, which insures residents of flood-prone areas. They also govern the state’s ability to determine where development may occur in relation to those areas. Local and county officials haven’t commented since the tool was published in early March, Lathrop said, but some were involved in its planning, which took about three years. Lisa Auermuller, watershed coordinator for the Jacques Cousteau National Estuarine Research Reserve, which is managed by Rutgers, coordinated with local officials and sought their feedback. 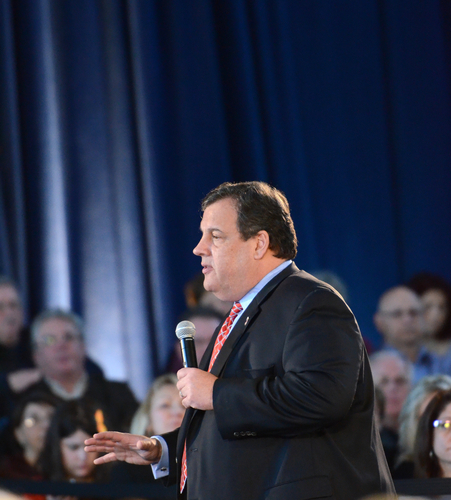 New Jerseyans have very clear and very strong opinions on rebuilding after Superstorm Sandy. They also think anyone who ignores federal advice about rebuilding should face serious consequences. That’s just a portion of the results from the most recent Fairleigh Dickinson University-PublicMind poll released this morning. Read complete article or listen to audio here. Garden Staters of all political and social stripes agree with mandated rebuilding in a specific way. Education is about the only clear predictor of attitudes toward rebuilding, with the educated more strongly in favor of directed rebuilding than those with less than a college degree. Those with college degrees are significantly more likely to say those affected should be required to rebuild in a specific way (72 percent) or run the risk of forfeiting future assistance (66 percent) as compared with those with high school degrees (53 and 45 percent) or some college (56 and 56 percent). Even partisanship, something that often divides Garden Staters on issues related to public spending and government intrusion into private matters, is unrelated to attitudes toward rebuilding. The vast majority of Garden Staters were either unaffected personally by Sandy (64 percent) or are now completely recovered (21 percent), but one in seven (15 percent) still say they’re struggling to get back what was lost over four months ago. 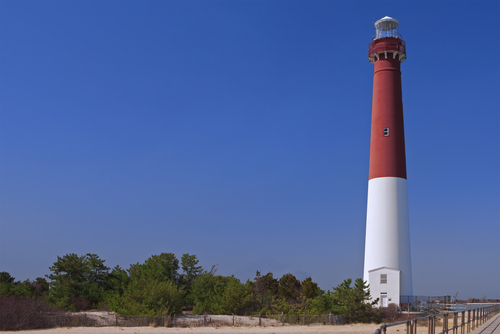 Their plight is recognized by many New Jersey residents. When asked if they were satisfied or unsatisfied with the pace of federal assistance to the state, half (51 percent) report dissatisfaction, while significantly fewer (30 percent) are satisfied.